It was nothing I hadn't done before. Cuddled up in bed and grabbed a book to console me while I fell into slumber. They weren't words I hadn't ready before. The Encyclopedia of Birthdays; my own day, April XXI complete with scribbles, highlighted sentences and affirmations. It was nothing that hadn't happened before...I write an entire post complete with an out pour of emotion so rich that it feels like bathing in oil, only for some mishap to claim my words and have them gone forever. For lack of energy, my book having done too good a job in consolation, I slept and left my sentiments for another day. She said the Tarot card associated with my birthday was The World card. 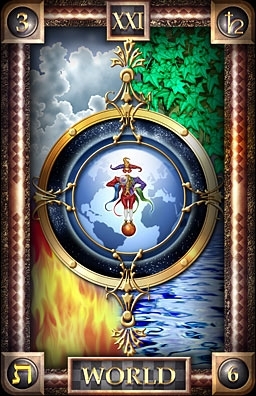 The card with the the woman who hovers between the earth and the heavens surrounded by four beings (a man, an eagle, a lion, and a ram) said to represent the four elements (water, air, fire, earth). She hovers as the medium between the two worlds she is the ending of one cycle and is the pause between our next big adventure. She is consciousness. The book tells me how the color purple will energize me, it will focus me on graciousness and consciousness rather than the physical. I looked back at the purple evening gown hanging in my door frame and let myself fall asleep. Naturally thin. That's what it says I am supposed to be, regardless of my tendency to indulge and partake in decadent pleasures, my birthday means for me to be thin. When I look at photos of me in my early youth, I see it. I think I had forgotten so I stole a picture from home and hung it on my bathroom mirror so that I remember that it wasn't always like this. As I work on moving past the obsession with size--of being too big or too_________ and just the sheer obsession even with accepting it I want to throw it all into the wind and let the cards land where they might. Funny though that it took reading the words "naturally thin" for me to remember there was a change, there was a shift and at some point something else was a reality for me. Did I mention the vibrations? When I read the words that were not new to me, the old familiar sentences and familial paragraphs my body responded. I touched my hand to my cheek to see if I was imagining it or if it was really happening. I remembered this post--the first sentence reads, "Ever since I knew what the avatar was I thought I was one. " It feels like I should not admit that. It feels too outlandish, too far-fetched, too presumptuous, too audacious, too arrogant. But its the truth and I am saying it outloud because I understand that I must. That truth gives me peace that descriptive language has yet to evolve enough to explain. And then my lungs hurt, grief...gone are the days when I can put my head in the sand and pretend not to know what is blindingly apparent to me, and maybe on some level to others as well. I think this year is going to be about fire. It already seems to be trending in my life. I remember my lessons in water--Nama and last January, I remember earth...my Toph, literally in MA. Now I am discovering fire. In the way that I initially saw no part of it in me and saw only our contrast, it has shown me how we coexist and its true place in my life. Right now I am learning to live with fire. I said that and my belly got warm, and I know that is right. I don't always know what it all means but I know it, and for once that it and of itself is enough for now. Spiritual Autobiography: What's in a name?